Society, running, and biomechanics: A systemic exploration (and a hint of future topics). Systems thinking is more than a theory or a scientific trend. Systems thinking is an idea, an understanding that reality organizes itself into systems. All the tiny different parts of reality—regardless of whether you cut up the pie into atoms, physical forces, or currents of social change—are interconnected to one another. They all interact in chaotic, highly unpredictable ways. Systems thinking was designed to try to explain, model, and predict how “stuff” that seems to be completely unrelated from other “stuff”—like externalities—interact to create highly complex behavior: creating a system. Strictly speaking, a system isn’t built out of parts; it’s built out of interactions. It’s possible to have a collection of parts, but as long as they’re not interacting with each other in some particular way—as long as they don’t form part of a structure (a dynamic structure in this case)—they aren’t a system. Therefore, systems thinking allows us to model how different “chunks” of reality interact. The reason I write in such vague terms—“chunks,” “stuff”—is because the parts of a system can be completely different: the same system can be made out of matter, machine, social fabric and other semi-isolated systems all at the same time. Ideas create modes of thought, which lead to identities, which lead to social currents. Ideas can lead to the creation of concrete entities such as cities or factories, or organized structures such as production lines or human teams. But there’s many other forces at play. The idea of foot-striking is influenced by what I like to call “shock-and-awe” culture—a culture where impressiveness and supremacy is paramount. Our “foot-strikes” should reflect this violence. But this supremacist culture comes from a long-standing tradition of colonization and displacement of less technologically advanced societies—societies whose members by definition live fewer steps removed from nature. Because more people become injured, less people run, and the more we are scared of this activity. Therefore, the core paradigm of the system—the belief that running is bad, and will just hurt you—becomes entrenched. There is nothing to stop injury rates spiraling out of control—except, in my opinion, the understanding of the system. (Please see point #2 of “about this blog”–link is here–if you see inaccuracies in the model as I’ve laid it out). Systems thinking is a very powerful tool to describe and understand the forces that influence our athletic development: our biomechanics are at the mercy of our ideas, and our athletic output is at the mercy of our identity. A tool that can link such different concepts together is necessary to catapult us into greater athletic achievement; it is my opinion that increasing achievement is born ultimately out of understanding, of which development is a side-effect. But systems thinking does more than just let us model interactions with cool flowcharts. Scholars of systems thinking have narrowed down a series of “archetypes,” a series of basic systems that are highly ubiquitous—a few, basic structures. Because of these archetypes, we don’t need to figure out every single detail of each tiny component of the system: as long as we have a deep understanding of a particular system and a comfort with its interactions, we can work with it effectively. If it matches one of these archetypes (and it usually does—see my discussion on stretching and flexibility), that is enough for us to be able to predict with great accuracy where and how we can intervene. Of course, the trick is to develop that deep understanding and comfort. This illustrates the most important piece of systems thinking: Peter Senge and Otto Scharmer, leading scholars in this field, have each elaborated extensively on the importance of achieving an intuitive understanding of the system, in order to grasp the essence of the interactions and the components within the system, and between itself and other systems: what purpose does this system have? What problem is it trying to solve? Why does it spike and crash? How does activity in it ebb and flow? In this journey, the mere plotting of flowcharts or indulgence in guesswork will not do: systems thinkers must develop the necessary cognitive framework to correctly understand and predict the behavior of the whole, even if some individual parts remain obscure (which they will: “all models are wrong, and some are useful”). Contemplative mediation—Zen meditation in particular (see Koan introspection)—leading to self-knowledge, remains the most well-known road to that end. Now, why exactly contemplative meditation and systems thinking go hand in hand, is a discussion for another time. Previous Post(Not) running quote of the dayNext PostSystemic archetypes: Shifting The Burden. 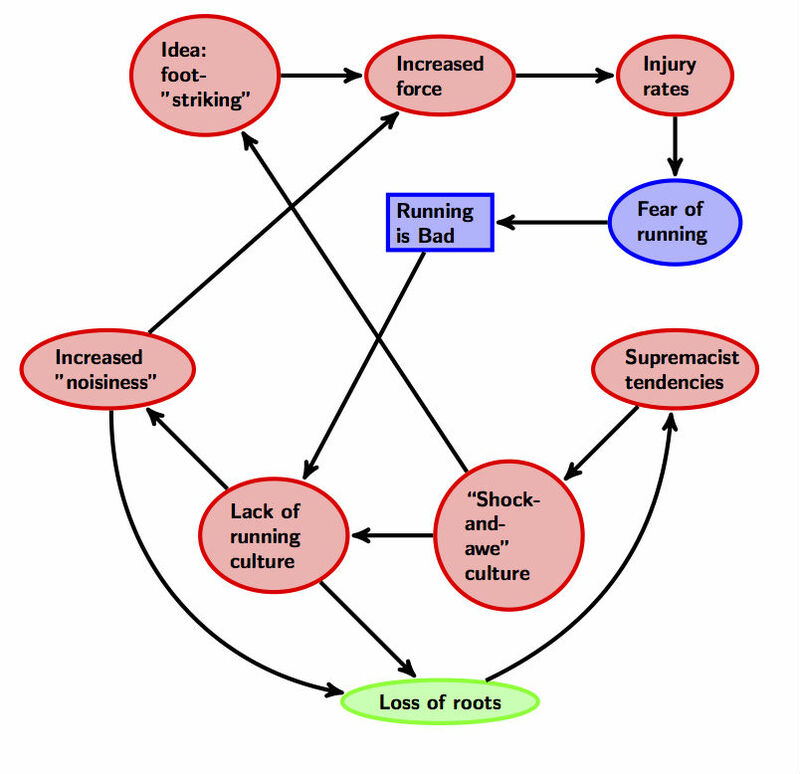 Question for readers: Do you think it’s a fair statement that a loss of running culture corresponds or feeds into a “loss of roots” (including physiological, biomechanic, and so on)? What is your opinion on how they play into larger cultural attitudes?